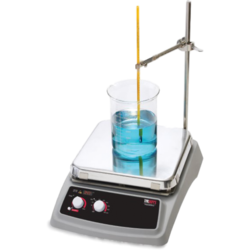 Our range of products include hot plate with magnetic stirrer. Keeping in mind diverse requirements of the clients, we offer a wide range of Hot Plate With Magnetic Stirrer that widely finds its applications in various types of laboratories. Our offered product is developed with basic material and modular tools, under the supervision of our experts. We are offering this product on various specifications as per the client’s requisites. Our valuable customers can avail this product in a given time frame at industry leading price.